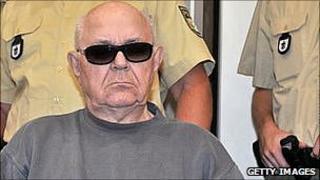 Spain's High Court has requested an international arrest warrant for suspected Nazi war criminal John Demjanjuk. A judge says he is accused of being responsible for the deaths of Spaniards in the Flossenburg concentration camp where he was a guard. He is currently on trial in Germany accused of being a guard at the Sobibor camp in occupied Poland in 1943, where an estimated 250,000 people died. The 90-year-old denies the charges. Spanish Judge Ismael Moreno, in a ruling dated 7 January but released on Friday, said Mr Demjanjuk is accused of "complicity in crimes of genocide and crimes against against humanity" in his alleged activities at Flossenburg. He called for a European arrest warrant given "that he is currently in Germany and on trial", in order that he can be arrested and eventually tried in Spain. The ruling says 155 Spaniards were held at Flossenburg, 60 of whom died. Judge Moreno has been investigating the issue since July 2008 at the request of several Spaniards who survived the camp. Ukrainian-born Mr Demjanjuk was extradited to Germany from the US in 2009.